A good place with great interiors not only looks resplendent but also beatific. Working or living in a space with exemplary interiors adds a different edge to the complete environment. And thus, choosing the best interior designer who can turn your house, office or commercial space into a paradise is a must. 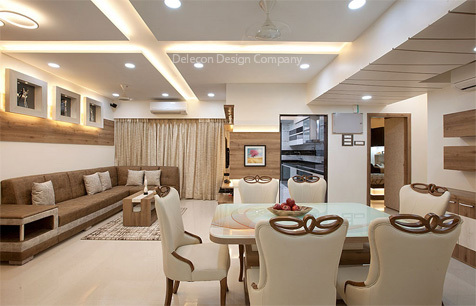 Delecon Design Company is one of the prominent names in the field of interior designing across Mumbai, Suburbs, Navi Mumbai, South Mumbai, and Thane. Our services range from offering interior designing solutions, conceptualizing designs based on the requirements laid across by the clients. We have completed numerous projects in different areas of Thane across Kalyan and Ulhasnagar making us one of the most renowned Interior Designers in Ulhasnagar. Ulhasnagar in the suburb is a growing ground for real estate boom with many commercial and residential projects coming up in full swing. The place comprises a majority of the Sindhi population who is known for leading a posh and luxurious lifestyle. The same is found in their very taste of interiors that comprise an edge for an aesthetic touch. Major population in the area are involved in businesses that are related to Apparels, Construction, Food, and Production. Moreover, considering the rich taste of citizens residing in the area, the ground for experimenting with good interior ideas and the freedom to develop exceptional designs are high. Seen as a lucrative platform for business, Ulhasnagar has also witnessed a lot of offices coming up in the strategic regions. We deem to offer state-of-art work, rendering the best services which can make each project stand apart from each other and speak for itself. With the suburbs getting developed at a fast pace, Ulhasnagar happens to be the next most chosen destination for housing and residence. In addition, the growing businesses and offices in the area have made it a lucrative choice for the residential boom. We at Delecon Design Company are recognized as popularResidencial Interior Designers in Ulhasnagar. As renowned Residencial Interior Designers in Ulhasnagar, we aim at offering exceptional services which are in lines to the ideas drawn by our clients. We house a group of exceptional interior designers who hold years of expertise in the field. Having worked in a wide range of projects, we offer exceptional services that can make your home look no less than a paradise. Transforming your ideas into reality is our very crux and our team of professionals leaves no stone unturned in offering work of complete craftsmanship. Our residential projects include conceptualizing and ideating interior designing for flats in different configurations, Bungalows, Farm Houses, and Pent Houses. We have successfully completed a number of projects that include Bungalows at Guwahati, complete renovation of 3 BHK flats, and much more. To get a detailed outlook of our projects, visit our website and have a look at our various other works. Being a potential ground for businesses, there are an increase in Commercial projects in the area by many eminent realty developers. Delecon Company is one of the primary choices for Commercial Interior Designers in Ulhasnagar working in collaboration with many realty builders. As Commercial Interior Designers in Ulhasnagar our projects include developing interiors for offices, Hospitality sectors, restaurants, hotels, malls and much more. Who wouldn’t like to work in a place that is aesthetically enchanting and comfortable? Delecon Design Company has worked in numerous projects as Office Interior Designers in Ulhasnagar giving a complete makeover to the workplace. What Makes Delecon Design Company Exceptional?